Each week we feature an app that has caught the attention of the Crozdesk community. We look for exciting features that make our lives easier, apps that take a radical approach to existing problems or a service that has everyone talking about it. In other words, apps that we think you should know about. This week’s featured app is online content creation platform Riddle – a tool designed to create brilliant and engaging online content. A staggering amount of online content is generated every single day by individuals and businesses wishing to have their voice heard online. Any business looking to promote themselves effectively will need to start by cutting through this abundance of information and produce content which stands out. The best way to do this is to create original, unique, relevant and genuinely useful online content that people actually want to read, share and like – the content that businesses put out online should be a resource for their target audience. One way to boost the impact of online content is to make it interactive on the basis that an audience is more likely to engage with content if it is designed to be engaged with. It is for this purpose that interactive online content creation tool Riddle has been designed – Riddle allows users to quickly create visually impressive content which is purpose-built to engage with consumers. In order to help users create content which reaches and engages their target audience, Riddle offers five different types of content. Choose from Opinion Polls, Lists, Pop Quizzes, Personalities or Surveys. 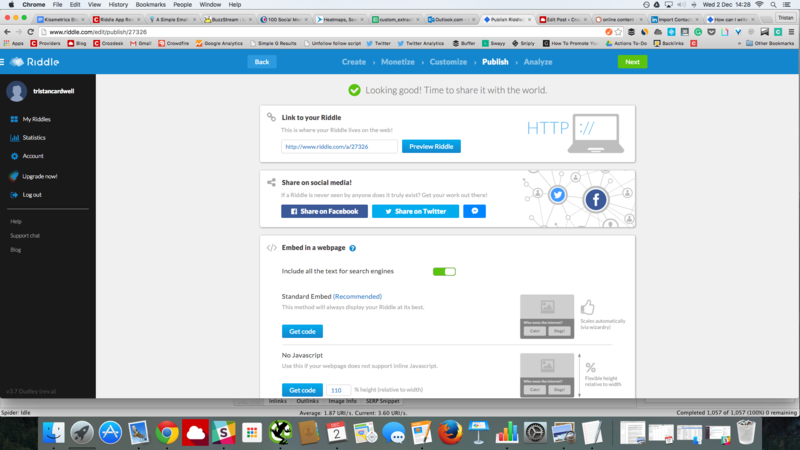 Opinion polls: In choosing to create an opinion poll, users have the option to either create a new poll or use Riddle’s template. 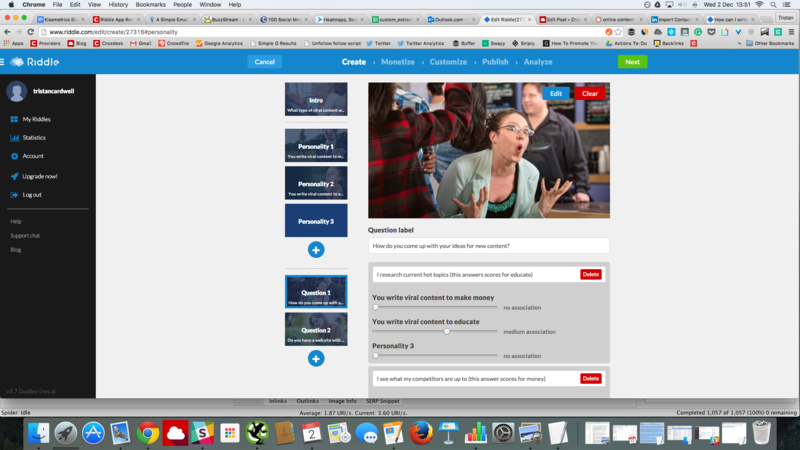 Creating an opinion poll using the template is straightforward, choose an image for the poll, enter a title and main text, then determine the possible answer options. Choosing to create a new opinion poll offers users extending functionality and customization, including the option to add an image, YouTube clip, stock image, Facebook article or uploaded file. Lists: Designed for producing list-based content, users can choose to create a new list from scratch or use Riddle’s template. 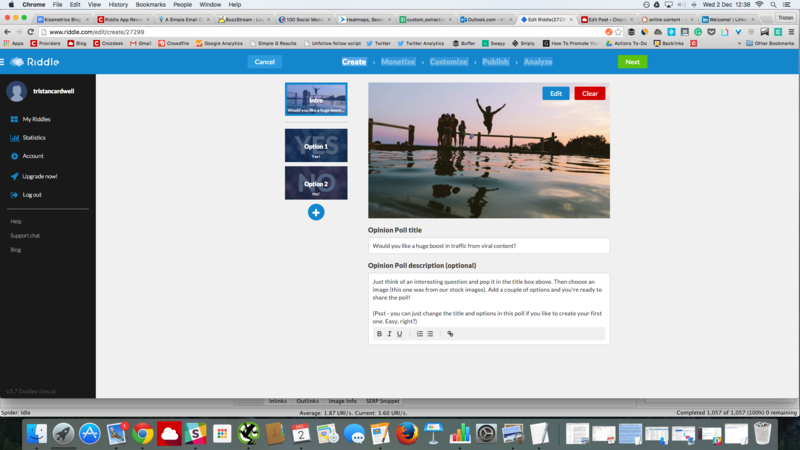 Users have the option to change the main photo for a file or image of their choice and can change the text of each list item. Personality: The personality function allows a number of personality types to be associated with specific questions. 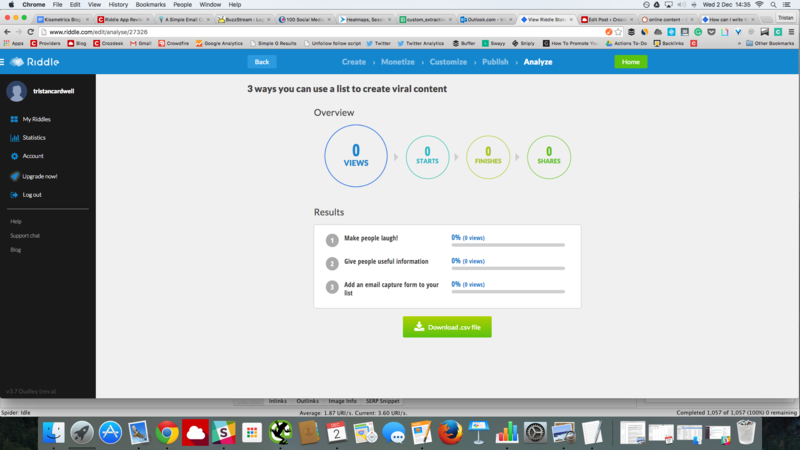 As an example, the Riddle template for this content type has the title “What type of viral content writer are you?” The template features two possible personality types: “You write viral content to make money” and “You write viral content to educate.” One of the questions in this template asks: “How do you come up with your ideas for new content?” The possible answers to this question are: “I research current hot topics”; “I see what my competitors are up to” and “Over a glass of something at my favorite bar.” In the set up for this type of content, it is necessary for users to specify the level of association that each question has with each personality type. In this example the answer “I research current hot topics” scores more highly for the educate personality type. While fairly straightforward, this option becomes more complex as more personality types are added. Each new personality type added is automatically added to the associations settings for each answer, requiring the user to select the strength of association between each personality type and each answer option. Survey: This option allows users to create surveys featuring text field responses, multi or single choice answer options. It is important to note here that the free version of Riddle only allows for survey responses to be emailed to single email address associated with their Riddle account. In order to download responses in CSV format it is necessary to upgrade to Riddle’s pro plan. Although a minor drawback, it is also worth noting that the survey functionality offers no option to skip questions or redirect participants to different questions depending on the answers they give. 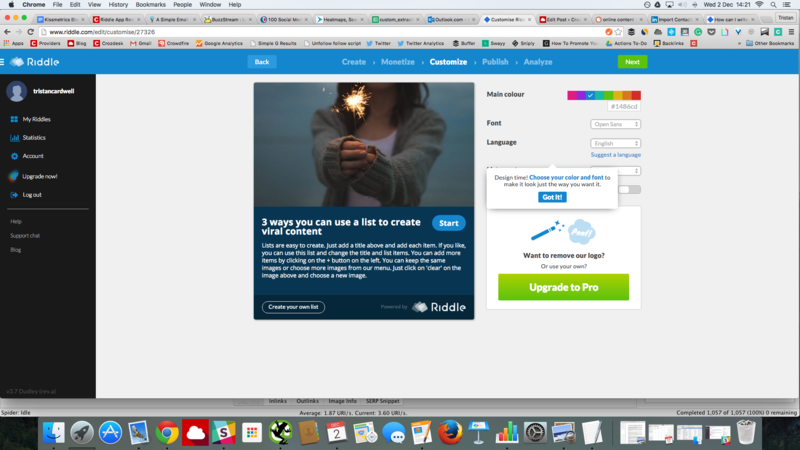 The monetize feature within Riddle allows users to turn their content into new business opportunities through lead generation, Mailchimp or custom ads functionality. The lead generation option offers users the option to add up to two additional fields to their content, which can be filled in by viewers of the content. These fields might include an email address or contact number or name – highly useful information for businesses looking to turn their content into a prospecting opportunity. 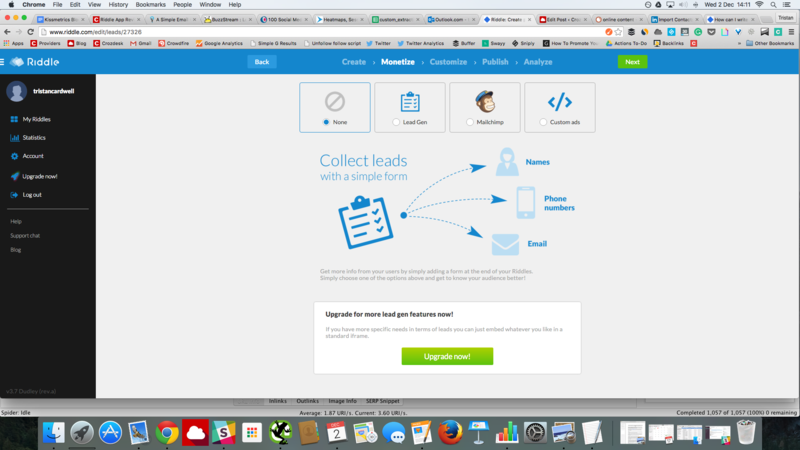 The lead generation function also includes the opportunity for a conversion tracking URL to be inserted, providing that a business already has conversion tracking set up. Mailchimp integration allows users to synchronise and share their content with pre-created Mailchimp lists, highly useful for sending content to a list of existing contacts. The custom ads feature is currently unavailable but promises to allow users to run their own ads from within the content they create and to keep any revenue generated from these ads. The customise function within Riddle allows colour, font and language adjustments to be made to your content before it goes live. 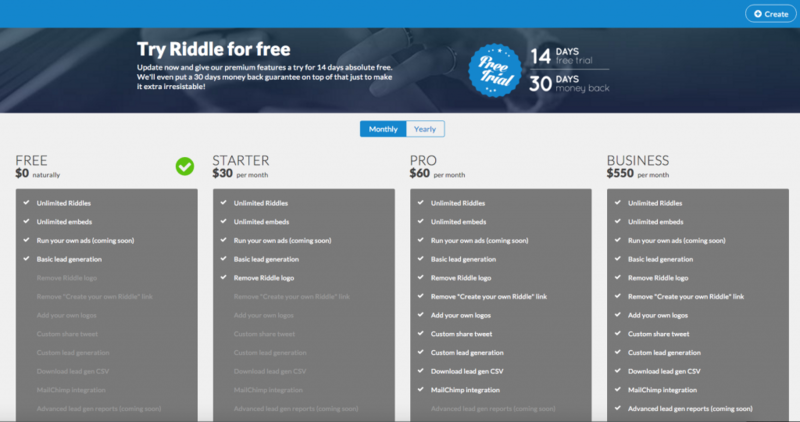 The paid versions of Riddle allow the “Powered by Riddle” and “Create your own list” logos to be removed here, dependent upon subscription level. The most impressive thing about Riddle is not the carefully-crafted UX or the well thought out functionality but that, like all the best products and solutions, it fills a niche in the market. 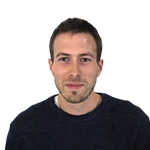 The Riddle team have observed that the importance of online content has increased dramatically and that the ability to put out large amounts of high-quality content is a must if businesses are to stand out online and engage with its customers. 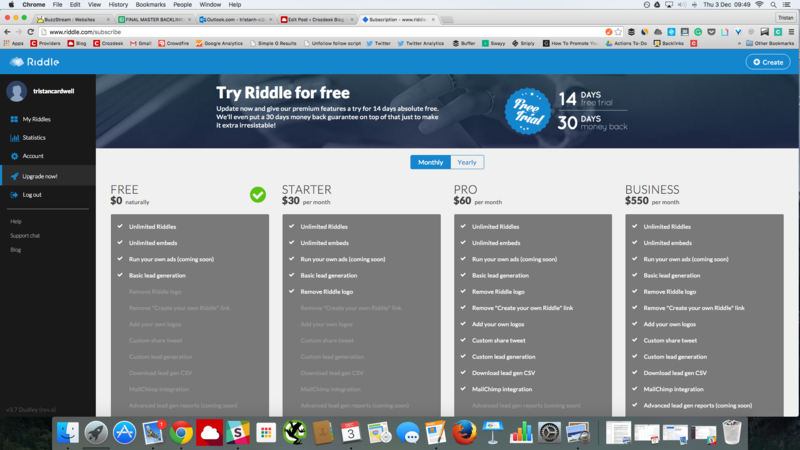 Riddle is easy-to-use and makes the task of generating visually attractive, interactive content, far easier. Find out more about Riddle – visit the Crozdesk Riddle provider page.